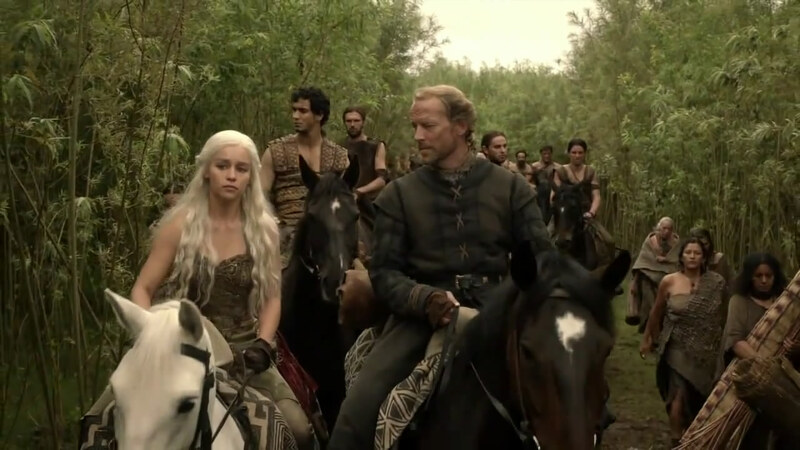 A good shot of Daenerys riding along with Ser Jorah and the Dothraki. This is, I believe, another scene not shown at such length in the web version. The khalasar is here referred to as a horde, but this is a phrase used repeatedly in the novels as well. Elyas Gabel, as Rakharo (originally named Jhogo, until it was decided his name was too similar to Drogo’s and it was swapped for another of Dany’s khas), is behind her. The people on foot may be slaves (certainly, the one in front has a collar).